During our encounters in Japan, we've had to sign for multiple things, such as packages, notifications, and even when opening bank accounts and getting cell phones. While "modern" Japan can accept Western signatures, many services still require a Hanko, or a personal stamp, as a signature. A Hanko (判子はんこ) is a small personal stamp that can act as your signature on certain documents. Many Japanese people have one that has the kanji of their surname on it, while others have their full name. Hankos can vary in style; some have only one character while others can have 8. Some hankos are simplistic and others have advanced symbols (non-kanji) on them, but not often. Hankos can also come in various shapes, with the tall cylindrical shape being the most common. Many Japanese people don't sign their name to documents. Instead, they use a hanko to stamp their seal on the document instead. This carries over for many modern-day services, including contracts, agreements, and other items. If you move to Japan and need a bank account and a cell phone, you are going to need a hanko in order to process the paperwork. Otherwise, the person (probably) won't let you open an account. From my personal experience and research, there are many places to get a hanko, but probably none that you've heard of (I'm not trying to be hipster here, because unless you know where to look, getting a hanko is hard). Many places online can make a hanko for you online (here are a few options) for a range of prices, starting from ¥100 (that's roughly equivalent to $1) to well over ¥10,000! Some people may say "You can pick up a hanko at the local dollar store" (99% of the time, they're talking about Daiso), and after doing some extensive looking, I have found plenty of hanko supplies, but no hanko that I can purchase and use. However, if you are Japanese and the local dollar store has a hanko that has your family name on it, then you're in luck. If you aren't Japanese, it's like trying to find your name among the hundreds of "personalized" trinkets at the amusement park. However, short of visiting specialized hanko shops in the nearest international city (Narita) that I can access, I found a place that can make a hanko for you for only ¥500 and about 15 minutes (see next section). Presenting a Hanko Printing Machine! These machines can print (well, carve) a hanko for you in about 15 minutes, kind of like a 3D printer, but it carves the stamp out of a piece of metal, plastic, or even stone. All it needs to know is what you want on your hanko. Personally, I chose my first name (Kyle; Japanese: カイル) since that's what everyone calls me. Keat has her own version (キート) that she got from somewhere else. We also tried to get one with our last name (パーキンス), but the machine would only allow 4 characters per line, and that wouldn't really work. As long as you can read some basic Katakana, you should be in business. The buttons may seem a bit confusing, but after some trial-and-error, it became obvious to which buttons that we needed to use. 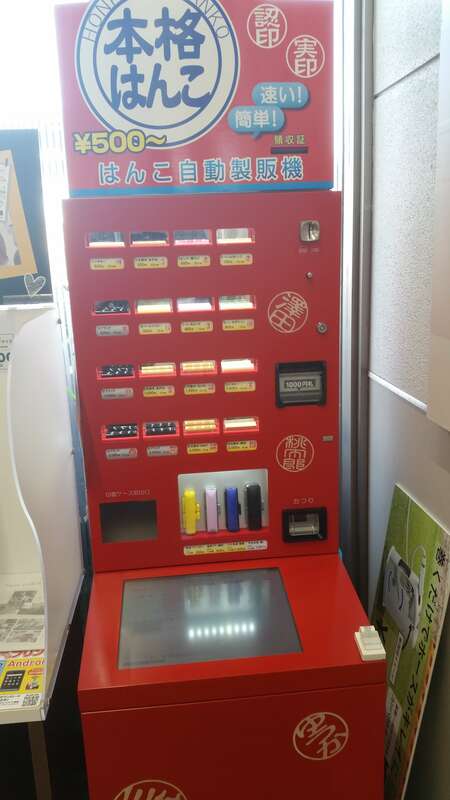 These machines can be found at various stores across Japan. So far, we've seen them at Cainz (see our video about Cainz) and AEON Shops, but we're sure they're elsewhere too. Once you have your hanko, just possessing it isn't enough. You need a few supplies. Two of the primary supplies you need are a carrying case and a stamp pad. Why? The stamp pad (or ink pad) is for you to get the ink needed to stamp documents, and the carrying case is so you can carry your hanko around with you without getting the residual ink on your other documents/wallet/pocket/etc. Can't I just use someone else's ink pad? I have yet to see anyone use a "communal" ink pad, although it may exist. Everyone that I've seen with a hanko (police, principals, store staff, etc) have their own ink pad system, whether it's an actual pad or some kind of auto-inking system. In all honesty, it may be considered rude to use someone else's ink pad, but I could be proven wrong. 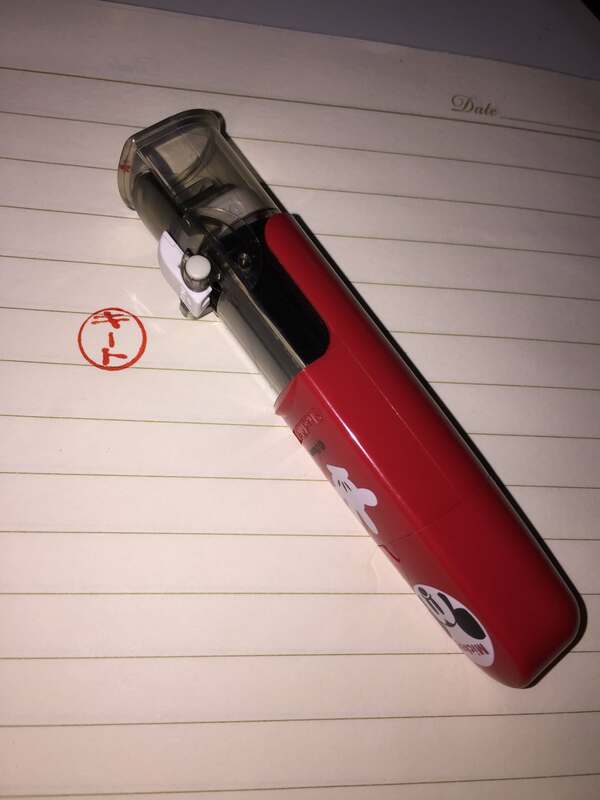 However, if you search around, you can also find a neat little "Stamper", which will house your hanko inside and automatically ink it when not in use, allowing you to just press and stamp your seal on anything. These can go for about ¥500, depending on where you shop. Much of Japan is still on the traditional path, which is true for many rural businesses (using only cash), banks (we'll do a whole article on this later), schools, and much of the Japanese mindset. Back in the early days of Japan (and many medieval European countries), stamps were used to "seal" documents (whether by actual wax seals, or to approve items). Japan carried on this tradition to this day, and still see the personal stamp (hanko) as a way to sign items. If you look at classic Japanese art, the red square (or circled) item in the corner is the artist's own hanko (like how artists can sign their pieces). With that, hankos are used in lieu of signatures because the seal is representing you. You as an individual can have a personal hanko, but most likely (Japanese or not), you'll have a family hanko representing your surname. Most of the time, when you sign (or stamp) for packages, documents, or other items, using your hanko is as easy as giving your signature. However, if you are buying a car or a house (or anything else "big ticket"), you'll need to register your hanko at your local city or town hall so they have a record of what your seal looks like. Because, although your parents, your siblings, and you could all have the same hanko seal, they need to know that yours is identifying you and that you've provided it for approval. A hanko is basically your signature: you sign (or stamp) stuff with it, and it's how you authorize items. But a hanko isn't as easy as finding one at a store (especially if you're not Japanese): you either have to have it made by a specialty store or find a service to do it. Additionally, you also need to find the necessary supplies to use it. Otherwise, you have a pen with no ink, and it's pretty useless.